Overview… pet chameleon on a mission.It was just another ordinary day for Rango when suddenly, his tank fell out of his owners’ car and into the Mojave Desert. After some harrowing encounters with a voracious hawk, Rango finally finds civilization in the form of a tiny, Old West town. But, his struggles are far from over. Dirt is suffering from a serious lack of water, and it’s up to Rango to save its citizens. Personality… lonely and imaginative. The townsfolk of Dirt are some of the first living creatures that Rango has ever spoken to, so it’s a pretty big deal. Unfortunately, he’s prone to anxiety and exaggeration. 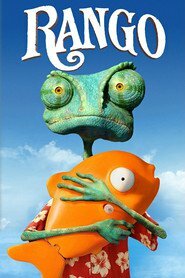 To fit in, Rango makes up some little tales that get him in big trouble. Rango's popularity ranking on CharacTour is #2396 out of 5,000+ characters. See our top-ranked characters and read their profiles.